I’m so thrilled about these upcoming events (3/7-5/4: two concerts, a play, and a lecture) that I’m inviting everyone. I’ll be buying my tickets in the next two weeks—and none of them are more than $25. Charles Bradley will be at Exit/In in Nashville on May 4th; the others are all in Louisville, through the Kentucky Center for the Performing Arts (voted four times as Kentucky’s best venue for music, theater and dance). Thursday, March 7, 7:30pm, MeX Theater, $18, $15 students/seniors. Alice Austen (1866-1952) fell in love with photography and another woman at a time when women were expected to do neither. 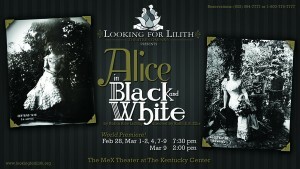 Marking LFL’s annual Women’s History Month production is a world premiere, Alice in Black and White, by award-winning published New York-based playwright Robin Rice Lichtig. I already saw this last week, but I’m ready to see it again—and there will be a photography talkback Thursday; and one on Friday, Fairness-hosted to discuss the themes of the play. Tuesday, March 19, 6pm, Bomhard Theater, $20, $110 w/ dinner. 1hr w/ Q&A following. Elaine Pagels is the author of Revelations: Visions, Prophecy & Politics in the Book of Revelation . Considered one of the world’s foremost religion scholars, she is the Harrington Spear Paine Professor of Religion at Princeton University and the author of The Gnostic Gospels (1979)—winner of the National Book Critics Circle Award and the National Book Award—as well as Reading Judas and Beyond Belief . The Gnostic Gospels completely changed my view of Christian history when I read it in college. Friday, April 19, 8pm, Brown Theater. $25 ticket includes digital download of Ritter’s brand new album (March 5th) The Beast In Its Tracks . Both artists got their start in the 90s and both are incredible songwriters. Saturday, May 4, 8pm, Exit/In, $15. All I need to say is that Bradley (b. 1948) is one of those rare artists who puts so much soul into his act that the audience can’t help but be with him every moment of the show.